This past weekend we had our third carnival, hosted by the University of Vermont. 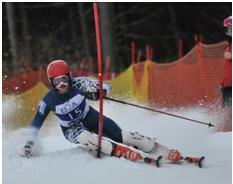 The races were located in Stowe, VT at the Trapp Family Lodge. It was a beautiful weekend, with blue skies and warm temperatures. Most of the team has skied here before, so we were quite familiar with the racecourse. We were also very excited to be staying at the Innsbruck. They provide robes in the room, so naturally that was the only clothing we wore. 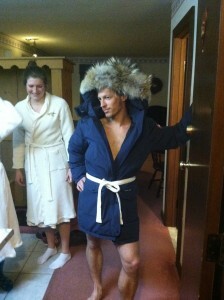 Kevin’s room was short a robe, so he figured Danielle McVicar’s winter coat would suffice. It did. Saturday’s race was an eventful one. The women did a 5k classic, and the men did a 10k classic. 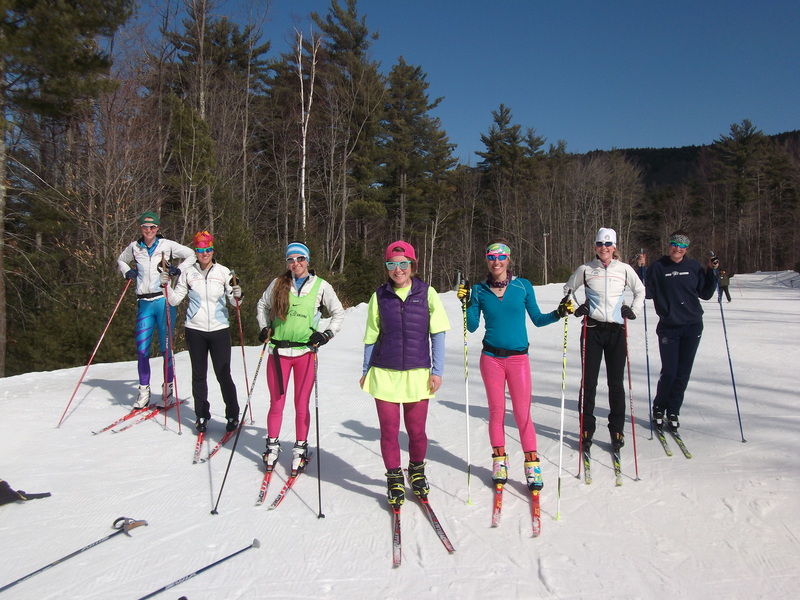 A couple hundred other racers joined us this weekend because the Carnival was also an Eastern Cup; this lead to some awesome ski racing. For the women we had Tristan Ramey cracking the top ten in 9th place, followed by Elizabeth Guiney in 10th. Elizabeth Izzo was our third scorer, finishing the race in 19th. The guys finished strong with Per Lindgren in 7th, Erik Lindgren in 10th, and Dan Guiney in 17th. On Sunday, both men and women did a 10k skate. 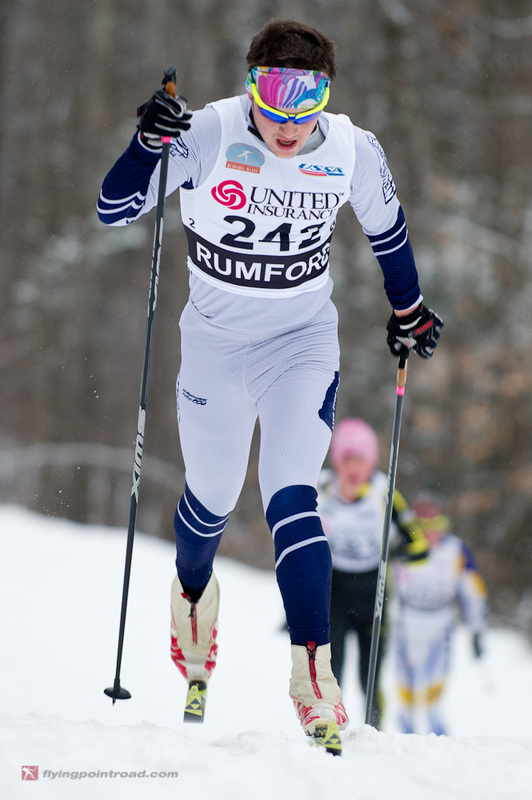 The women were led by Liz Guiney in 10th, followed by Liz Izzo in 16th, and Annika Taylor in 17th. Dan Guiney was our first guy in 23rd, with Johnny Springer placing 32nd, and Per Lindgren in 34th. Solid effort to everyone; this weekend had some tough races, but we held strong. It looks like the team will be racing at Trapps again next weekend for the Dartmouth Carnival. So stay tuned for those results, and another Tales of the Van. Carni-Crush is also that weekend, so I am sure you are going to hear some great stories of love, and inappropriate valentines. Peace out my friends. The UNH carnival! This is the one we had been waiting for. 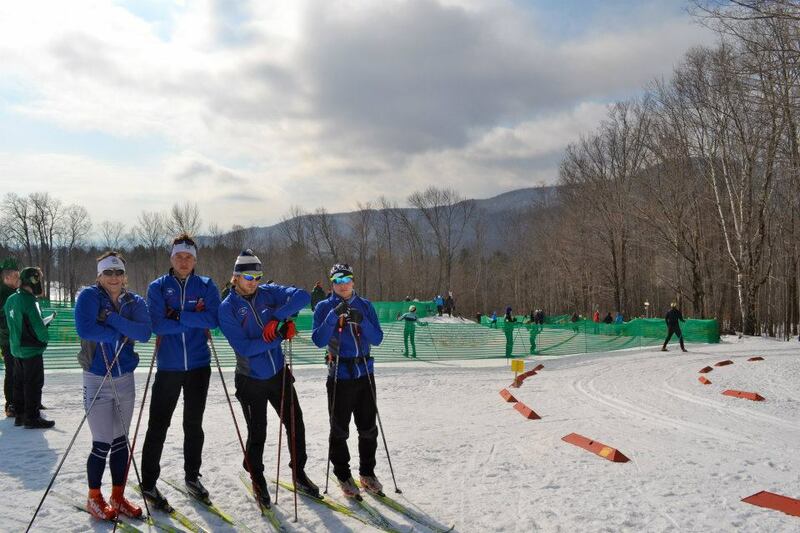 Besides Paul Atkinson and Zach Clayton no one on the team had experienced a home carnival yet, and we were excited to have a leg up on the other schools by racing at Attitash. We were able to stay at the same house we stayed at for our winter-break camp, which is a huge house just outside of North Conway, called “the Beast.” It almost feels like we are going home when we pull up to the Beast. It sits at the top of a usually icy hill and if you can actually pull into the driveway, you certainly earn bragging rights. Usually, some pushing had to be taken place, but that’s a man job as you can tell from the perspective of my photograph. Staying at the Beast, I don’t think I ever stop laughing and this trip was no different. Coming into Friday’s GS we knew the weather was going to be dicey, but I don’t think anyone expected how much snow we would get. It started out by hailing, but to be honest we were just pleased it was not freezing rain. Unfortunately, there was at least 8 inches of fresh snow on t he track which needed to be pushed off. The groomer was actually asked to make a few passes on the trail because it would be almost physically impossible to have enough speed on the flats to push the snow off the track. Once, the cat was finished grooming both the womens’ and mens’ field were asked to slip the wide line to try and get down to a hard surface. If you are looking for a hip flexor workout, try pushing wet snow off of Illusion for about 4 runs! The track was hard and we were all ready to start inspecting, when the race officials called the race off because of safety reasons. Of course, we were all pretty bummed, knowing how well we could have done on that trail. But, our sights were set to the slalom race the next day. With the unexpected day off, we all tried to find things to do at the Beast. The boys started a what I think was a record breaking length game of Risk, there was rummy played, foosball, ice ball fights, and of course tuning. Some of the team went to play soccer against UVM and Middlebury to see who would get the carnival win for the day. 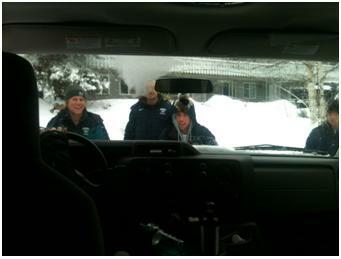 Of course, UNH pulled through, beating both schools and I think it is safe to say that if there was a duel NCAA sport of soccer/skiing we would be untouchable. For dinners we all traveled up to where the Nordics were staying at the Eagle House and had a couple of pasta dinners which carbed us up for the next day. As for lunches, I’m pretty sure we were the luckiest team on the circuit with the amount of food both the Halapowski family and the Lepine family brought. So a big thank you to them! 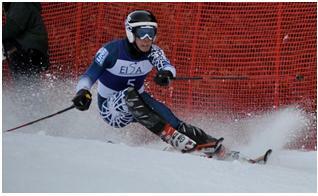 The slalom race held great results for the Wildcats. Zach Clayton and Sam Coffey finished 4th and 5th respectively, and Paul Atkinson rounded off our top 3 in 15thplace. But I think we can all agree that if we were basing the results off of the best facial expressions, he would undoubtedly take home the gold. The girls had solid results as well with Catherine Blanchard coming in 7th, Marie-Elaine Lepine in 8th and myself in 12th. We ended up second overall for alpine, which is good, but I still think we can take UVM down if we all ski like we know how to! As it was a home carnival our friends were the main reason the slalom was pulled off so well. So we have a massive amount of thank yous to send out. 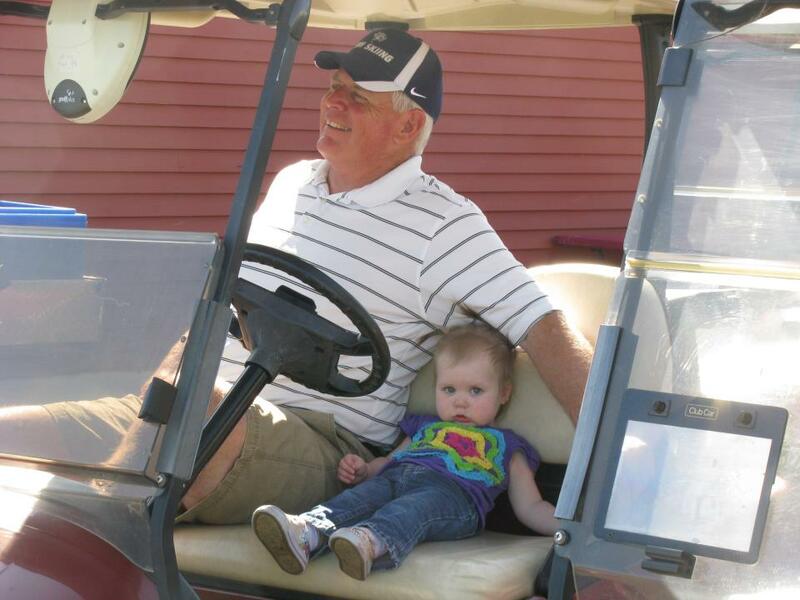 First of all, we all wanted to send our thanks to Paul Burton and the rest of the crew who were the reason the race was run as smoothly as it did had it not been for all of the slippers, gatekeepers, and course workers. We appreciate it so much! 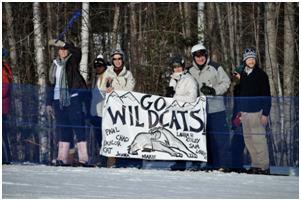 To have a cheering section was new to most of us as well. It was almost a little Schladming-esque being able to hear the blow horns and screams while racing. So to the fans we had supporting us, and all of the alumni who were able to make the trip up we want to thank you all so much! I also want to send a special thank you to Geoff Bonewald, Curtis Lush, Charlie Kidd, Eric Coffin, and Kris Hopkins. Not only did they forerun both the women’s and men’s race, but I would hear them rummaging around the house at 6 am to be on the hill setting our courses by 6:45 am. It was clear we had the best fore-runners on the carnival circuit. As they went one by one, the en tire women’s field was watching them and I kept hearing, “why aren’t they racing?” “they are so good.” Its evident how deep our men’s team is and how much talent each of them have. We will without a doubt see great results from each of them in the future. Our final thank yous go out to our coaches, Brian Blank, Katie Hitchcock, and Viktor Hlas. As stressful as this carnival was for the athletes, I can’t even imagine what it was like for them. So, thank you coaches! Overall, I was really happy with my first home carnival experience. 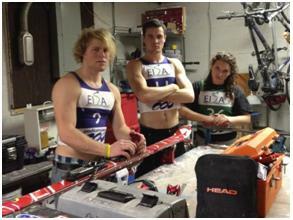 My team is pretty awesome, and I can’t wait to continue this chain of success at the UVM carnival at Stowe and beyond. This entry was posted in Random Posts on February 8, 2012 by admin.